When you think of upholstery cleaning what comes to mind first? Usually you think of cleaning a sofa. Well, upholstery cleaning goes beyond just cleaning couches. 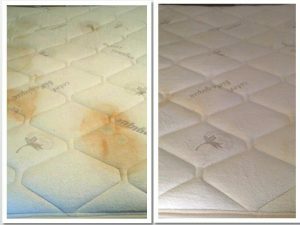 Upholstery cleaning also includes mattress cleaning, vehicle interior cleaning, and so much more. Beyer Carpet Cleaning specializes in upholstery cleaning. They provide a quality cleaning for a reasonable price. Beyer Carpet Cleaning offers an extensive upholstery cleaning that includes a steam clean, vacuum, pre-spray, and deodorizer. First step in upholstery cleaning is the pre-spray. The pre-spray includes an emulsifier and enzyme solvent that can remove at least 95% of any type of soiling, spots or stains. So if you have children or pets this is the best thing for your upholstery. Once the pre-spray is down the technician will gently and carefully scrub in the spray to ensure the most is cleaned out of your upholstery. Once the pre-spray has been scrubbed and sets in the technician will then steam clean and vacuum. After the steam clean it will take a couple of hours to dry. When the upholstery is finally dry you will see how amazing it looks. Beyer Carpet Cleaning takes very precaution to make sure that not only is your upholstery cleaning done right but is also taken care of. You don’t want an upholstery cleaner to over wet your furniture. Doing so will cause mold and mildew to grow which isn’t good for your furniture or your health. 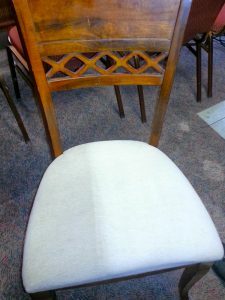 An upholstery cleaner needs to delicately handle your upholstery. Upholstery cleaning is also necessary to remove an dust mites, allergens, skin cells, and sweat. Beyer Carpet Cleaning can remove all of this they steam clean at 210 degrees which sanitizes the upholstery. Allow Beyer Carpet Cleaning provide all your upholstery cleaning needs. They will take care of your upholstery and your wallet. 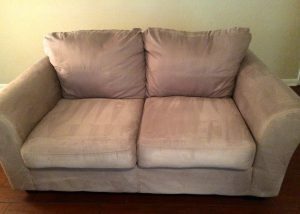 To clean a sofa and love seat or sectional it’s only $99.99. This is a bargain no one can turn down.